Emeralds are a variety of the mineral beryl (Be3Al2(SiO3)6,) colored green by trace amounts of chromium and sometimes vanadium. Beryl has a hardness of 7.5 - 8 on the 10 point Mohs scale of mineral hardness. Most emeralds are highly included, so their brittleness (resistance to breakage) is classified as generally poor. 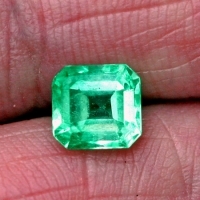 The word "emerald" comes from Latin smaragdus, via Greek smaragdos, its original source being a Semitic word izmargad or the Sanskrit word, marakata, meaning "emerald" or "green". Emerald is a May Birthstone. Fine grade gemstone from Colombia. Fine grade natural gemstone from The Chivor mine in Colombia.